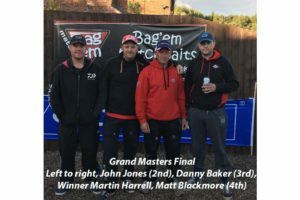 40 anglers turned out for the Grand Final of the Larford Grand Masters at Larford Lakes. Conditions were warm and thundery with heavy showers followed by bright sunshine. Winner on the day was Martin Harrell (Bag’em Larford) who drew fancied peg 28 on the Match Lake. Danny caught all his fish short on the pole with paste. 4th on the day was Matt Blackmore (Garbolino) who drew peg 78 on the Specimen Lake. Section winners collected £100 per section.